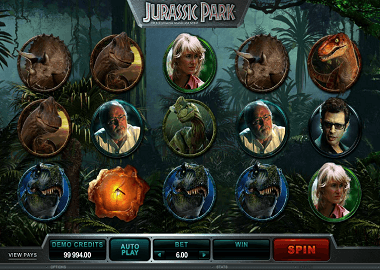 The Jurassic Park Slot by Microgaming is based on the blockbuster cinema which had worldwide success in 1993. It is a five reel slot with three symbols and 243 ways to win. The theme of the slot are of course dinosaurs. The reels are spinning in front of a 3D jungle background. You can find many of the original characters on your reels: Dr Alan Grant, Dr Ellie Sattler, Dr Ian Malcolm and John Hammond. In addition, there are plenty of prehistoric monsters and a whole bunch of bonus feature and Free Spins feature. Symbols and payouts: The Jurassic Park Slot has only theme related symbols. You will find a Tyrannosaurus, a Velociraptor, a Brachiosaurus, a Triceratops and a Dilophosaurus. In addition there are the 4 main players as well as wild symbols and a scatter symbol, a dinosaur egg. Already in the base game you can enjoy the T-Rex Allert Mode feature. This feature takes six spins and after the third spin the T-Rex appears on the 3rd reel. Watch out for the Jurrassic Park logo, which lands on the reels here as a stacked wild symbol! Tyrannosaurus Free Spins: You trigger the Free Spins feature with three Scatter, the Dinosaur Eggs. You will then get 12 free spins. There are 5 different Free Spins feature, each of the dinosaurs has its own feature. First, you get the Tyrannosaurus Rex Free Spins feature. When the T-Rex symbol appears here, all symbols become wild and you get a big win. Velociraptor Free Spins: The Tyrannosaurus Free Spins feature lets you play with Split Wilds or Wild Multipliers. Split Wilds create extra winning combinations as well as 6 of a kind. The Multiplier Wilds increase your winnings in the Free Spins with 4x, 5x or 6x Win Multipliers. The Velociraptor symbol also appears with 3 symbols on your reels. Brachiosaurus Free Spins: The Brachiosaurus Free Spins will benefit you from Mystery Multipliers. By chance you will get 2x, 3x, 4x, 5x and 6x multipliers on your winnings during the free spins. Each multiplier takes several free spins. You can also extend this Free Spins feature with 3 more Scatter symbols. Triceratops Free Spins: The Triceratops Free Spins feature gives you running wilds and re-spins. You get one wild symbol per spin and reel. If the reels are not completely filled with wild symbols, Triceratops stampede runs across your reels and gives you full reels wilds – that means big wins! Dilophosaurus Free Spins: The Dilophosaurus Free Spins feature is the last free spins feature you can play at Jurassic Park Slot. Here symbols are converted into Wild symbols each time the Dilophosaurus symbol appears. If these wild symbols make a profit they stick to your reels as sticked wilds until the feature ends. Microgaming games and also the Jurrassic Park Slot are extremely popular online slots. You can find these games in hundreds of online casinos. We’ve provided you with some online casinos below – use the exclusive bonuses and free spins when you register. If you want to play without a deposit, you can sign up at LVbet Casino, where you will immediately receive 30 LV spins for free. If you just want to play for fun, just click on the Jurassic Park banner above and turn the reels from the Jurassic Park Slot without registration and deposit!